A file photo of a statue of Confederate Gen. Robert E. Lee on the Virginia Memorial at Gettysburg National Military Park. 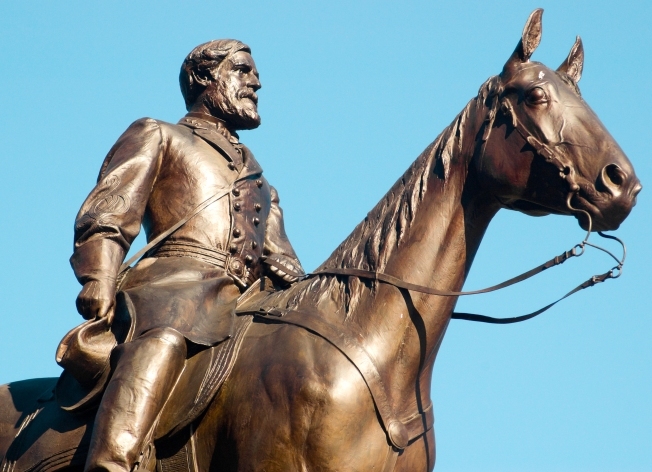 A recreation center in Fairfax County, Virginia, named after Confederate Gen. Robert E. Lee is changing its name after a local board vote. The Robert E. Lee RECenter has changed its name to the Lee District RECenter after a Fairfax County Park Authority Board vote. The Fairfax County Park Authority Board quietly moved to change the name of the rec center on Jan. 23 after a months long discussion, Judy Petersen, a Fairfax County Park Authority spokeswoman told News4. "We've looked at many, many facilities in our system that have attachment to icons from the Civil War and the Park Board has decided that they would rather go a different direction," she said. Documents from the Park Authority Board show that executive director, Kirk Kincannon, recommended renaming the center to the Lee District RECenter. The discussion to rename the center began on Nov. 14, 2018 when staff from the Park Authority Board Executive Committee agreed to research the list of current Fairfax County parks and facilities that have their names associated with the Civil War. The list includes parks that have been named after Civil War related events, locations and historical figures for both the Union and Confederacy. The document said that the Robert E. Lee RECenter was on top of the list for "renaming potential"
Fairfax park policy on naming criteria said that parks are generally named after their historical, geographical and ecological affiliation. The policy discourages renaming parks except after a "thorough" review in which the new park name is found to be “more appropriate than the existing name."